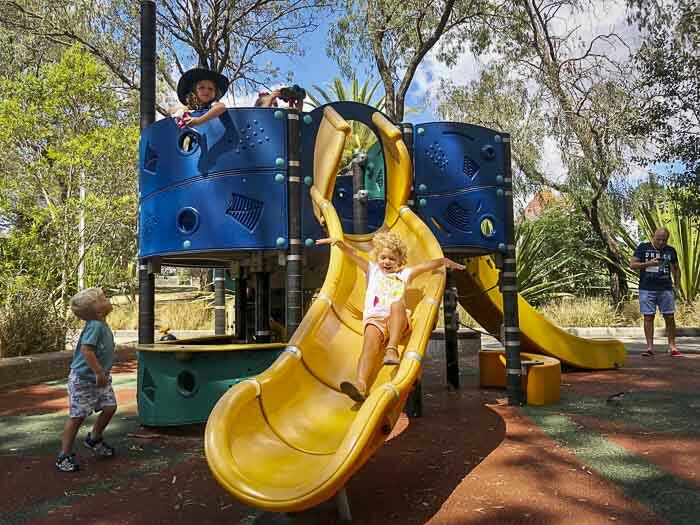 Ryde Park has always been a fantastic park for local families. With the new upgrade this year, it is even better. 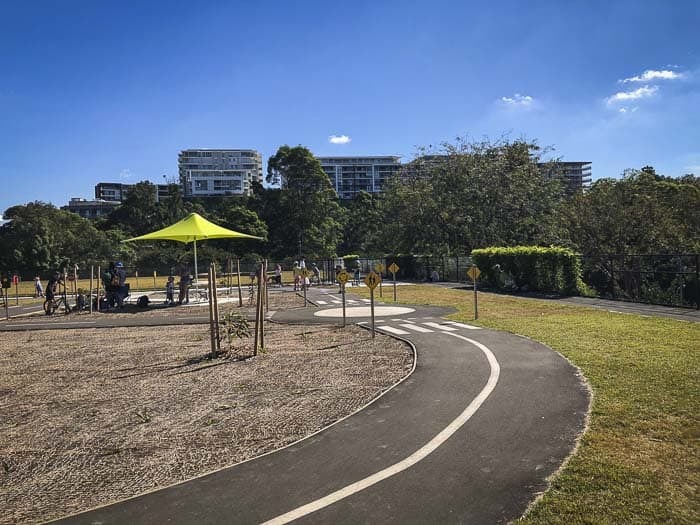 Ryde Park offers an amazing scooter / bike track for children and a new dog off-leash fenced area. 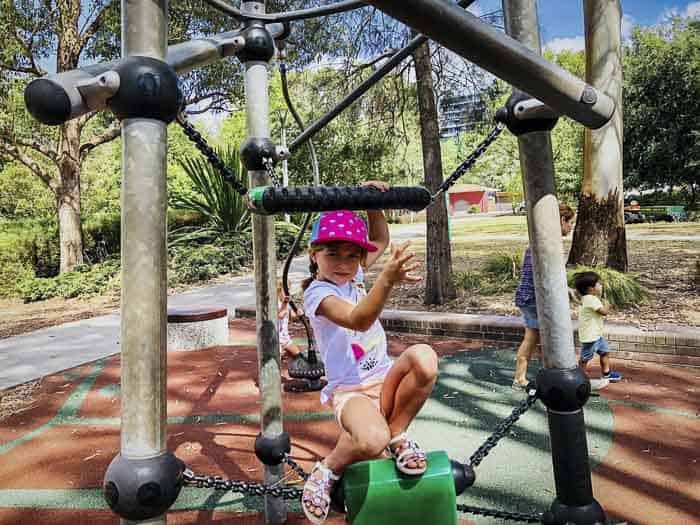 Although the playground is not big, overall Ryde Park is one of the best child friendly parks in Sydney thanks to its facilities and its convenient location. Also, the park has two large sports fields so there’s plenty of space to exercise. I particularly like going to Ryde Park because its playground is not an “empty ghost” one. Sometimes, being a full-time mum can be quite isolating… if you are looking for a vibrant place where you can socialise and maybe make new friends in the middle of the week, keep in mind this park. The playground at Ryde Park is not very big, but it has enough elements for toddlers and young primary school aged kids. Although the playground is not fenced, it is right in the middle of the park. The equipment consists of a see saw, a round basket-type swing, a small swing for little children, a cubby house structure with 2 slides, a spinner, a rotating wheel and a climbing structure for older kids that has some mobile / balancing arms. For older kids, there is a basketball court opposite to the playground, too. Also, not far away from the playground, there is a massive sandpit. Don’t forget to BYO buckets and spades! The Grounds Keeper Cafe is adjacent to the playground, but the visibility from the tables is not perfect. There is a big fountain between the tables and the playground with some vegetation, which makes it a bit difficult to keep an eye on little children. Still, it might be a great idea to take a break and maybe have a treat. Both breakfast and lunch menus include kids menus with popular options like the ham and cheese toastie. The cafe also ffers out of the ordinary dishes such as “pancakes with strawberries, vanilla ice cream and pure maple syrup” or “kafta skewers served with fries”. Yum! 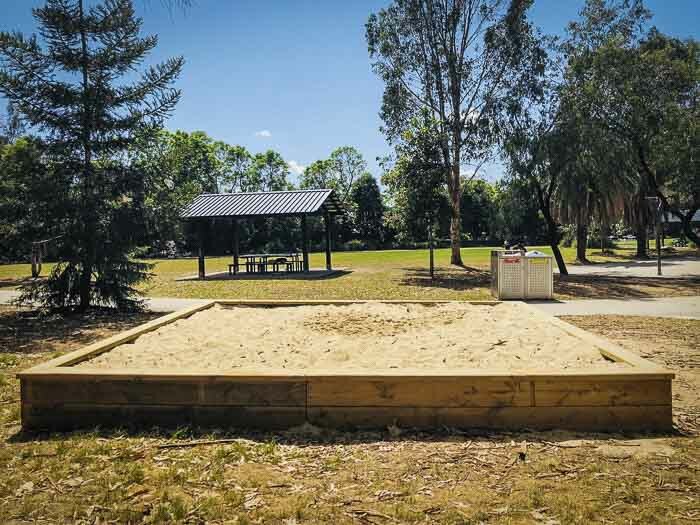 If you are more pragmatic or budget conscious, pack some snacks for the children and have a take away coffee, like I usually tend to do…Ryde Park has plenty of benches, drinking fountains, picnic shelters and open spaces to enjoy a picnic on the grass. The new scooter / bike track at Ryde Park is terrific. There are traffic signs, several roundabouts, traffic lights, zebra crossings, a racing section and even parking spots with the same signs that you can find in the street. (So, you might want to teach your kids some important stuff, such as the rules to avoid receiving a fine. My last one was more than $300. Ouch!!!). The scooter and bike track at Ryde Park is fully fenced with gated entrances at the car park and the park sides. The only drawback is that the track doesn’t have any mature trees. New trees were planted. So, hopefully this great space will be shadier in the near future. For the parents, there are three undercover seating areas with picnic tables, but you really need to be lucky to find one available. Toilets: Yes, included disabled one. 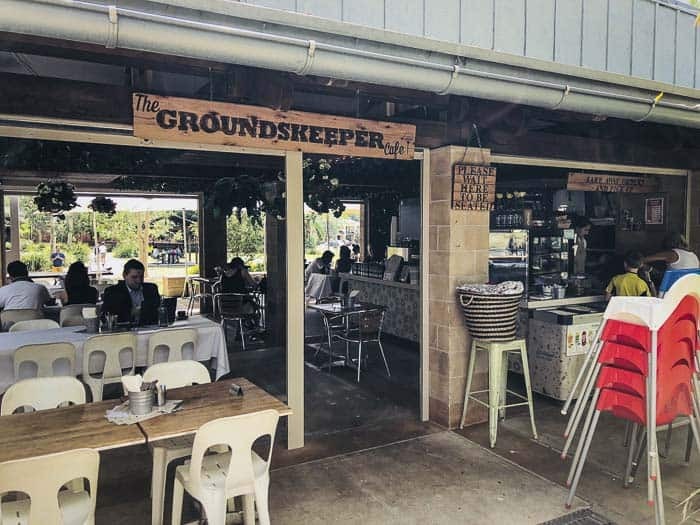 Nearest takeaway coffee: The Grounds Keeper Cafe opens everyday, except Tuesdays and the week between Christmas and New Year. Enclosed: The playground is not fenced, but it is far away from the streets. The scooter / bike track is fully fenced. Shade: Some areas of the park are more exposed than others, but in general there are lots mature trees, except the new scooter / bike track. 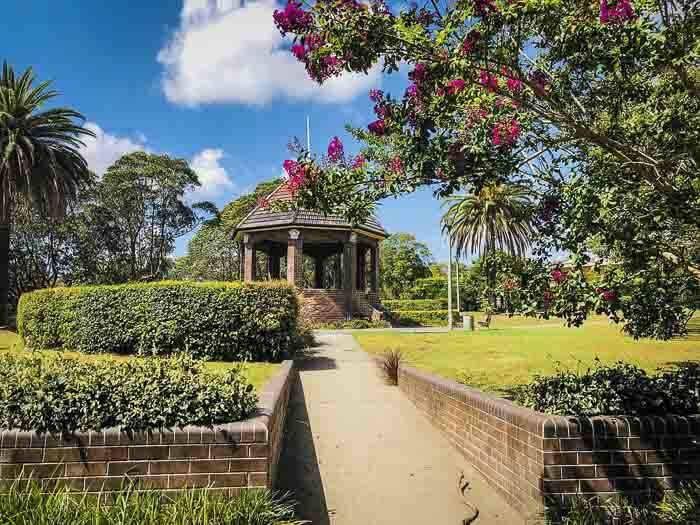 Mum’s report: If you are not a local, you might never imagine that behind the massive buildings of the Top Ryde Shopping Centre there is such a fantastic suburban open green space, the Ryde Park. Upgraded not a long time ago with a new scooter / bike track, it has everything that you need to spend a great morning or afternoon with the kids. Ryde Aquatic Leisure Centre is close to Ryde Park, read all about Ryde Aquatic Leisure Centre on this post. Top Ryde Shopping Centre and Ryde Library are very close to Ryde Park. Both of them are very child friendly. Possibly, Top Ryde is one of the best family friendly shopping centres of Sydney with its new upgraded indoor playground area and its ample plaza with great cafes and restaurants. The plaza despite not being fenced is designed to keep the kids busy with water spouts, a big screen and some outdoor toys. Unlike Boronia Park where you can walk to the supermarket, the distance between Ryde Park and the shopping centre is bigger. Despite the handicap of having to move the car and park again, you can still do some errands or grocery shopping after or before taking the kids to the park. Bus stop nearby: Several bus routes stop at Baxland Rd (287, 500, 501, 510, 515, 518, 520, M52). Note: always check for updates, if you are travelling by public transport. Parking: The best street to park without time restrictions is Argyle Avenue close to Princess St. The only problem is that you will have to walk a little bit, but there is a path behind the sports grounds that takes you directly to the playground. Best parking for the playground: try Argyle Avenue (section that runs parallel to Tucker St). This section is time-restricted and normally, it is very difficult to find a spot. 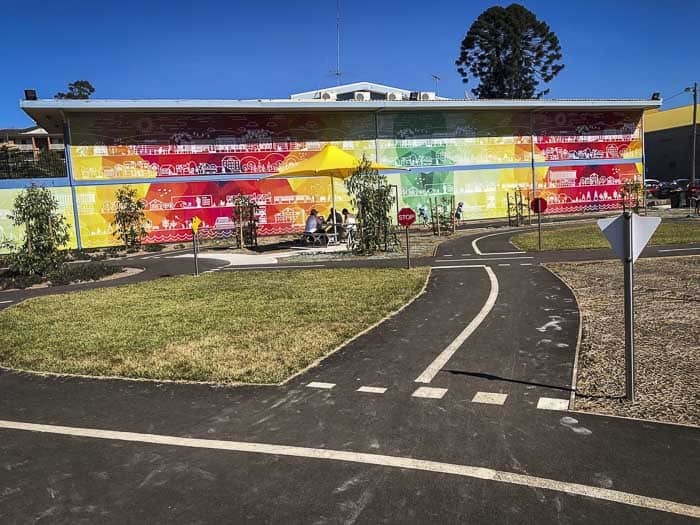 Best parking for the scooter / bike track: there is a car park with a 4 hour limit restriction at the corner of Blaxland Road and Argyle Ave, behind the Ryde Bowling Club. Our kids are very lucky. There are so many parks that have been upgraded with scooter / bike tracks lately! If you have run out of ideas for next school holidays, you might want to check our suggestions. 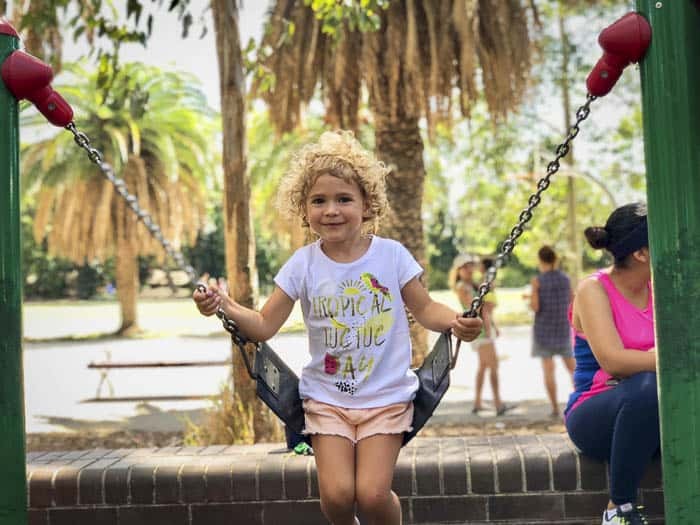 We recommend Strathfield Park for suprising your kids. If you have older kids, go west to Fairfield Adventure Park. Also, have a look at Seana’s comprehensive guide to Sydney’s best cafes besides playgrounds, click on here. And finally, don’t forget this list about the best kids bike tracks in Sydney for learning to ride. Winter is the perfect time of the year to discover new playgrounds, when it is not too miserable, of course. Come on, let’s go! We love Ryde Park. It is not only an awesome space for the kids, but also for the parents because of its convenient location. We choose this park when we catch up with non-local friends that live on Sydney’s North Shore. Do you have a favourite park that has a playground + cafe + scooter / bike track?